Of the many things apartment dwellers lust for, a backyard is at the top of the list. If you are lucky enough to live in an apartment with a yard or patio, you may be able to grow a garden in part of the space. Garden growing in the city is not as hard as it sounds. With some basic supplies and a little hard work, you can grow an assortment of vegetables in your own urban backyard. The choices you make for your garden should depend in part on who shares it with you. The garden and backyard may be shared among all tenants, available only to those on the first floor or available to a particular tenant. Check your lease before you assume that you are the only one with access to the backyard. Your landlord may also have restrictions on what you can do with the space. If you have any doubts, check first before you spend time or money on your garden. If you share the space with your neighbors, consult them before planting anything as they may have a different vision for the garden. Working with your neighbors to create a backyard garden can help you get to know other people in the building and share costs and labor. 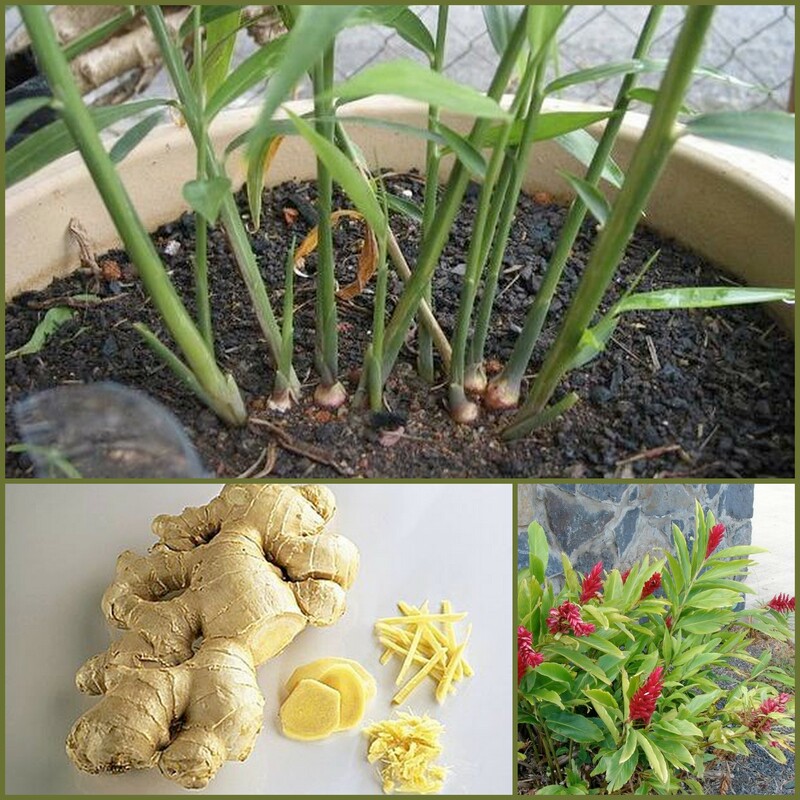 Different plants grow well at different conditions. Before you decide what you’ll grow in your garden, determine exactly how much space you will have to allocate to it. Some vegetables, like corn, require ample space and will not grow well in small lots. Others, like potatoes, require deep plots. You’ll want to assess the garden’s depth and make sure that there isn’t a layer of cement right below the soil. Take some time to observe how much light the garden gets on average. The presence of tall buildings around your yard may leave the garden in shadows for much of the day. The yard may look sunny when you leave for work at 8:30 am, but make sure the sun doesn’t disappear behind tall buildings by late morning. If your garden gets limited sun, seek out vegetables that grow well in lower light. When you are ready to purchase seeds and small plants, consult your local nursery or the planting guides that come with your seeds. They will inform you how much light, space and depth the plants require. If your building doesn’t have a backyard, or if you are just one of the unlucky tenants without access to it, you can still have a garden. 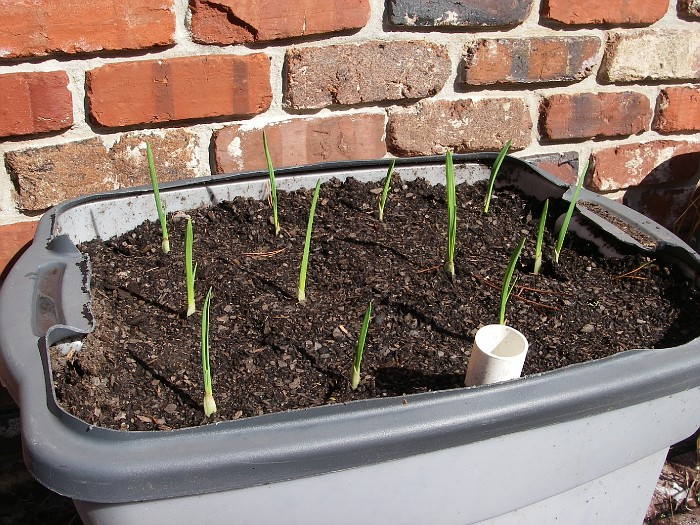 Many vegetables can be grown out of containers in your apartment. You can purchase containers or pots at gardening stores or use plastic bottles and basins that you already have at home. 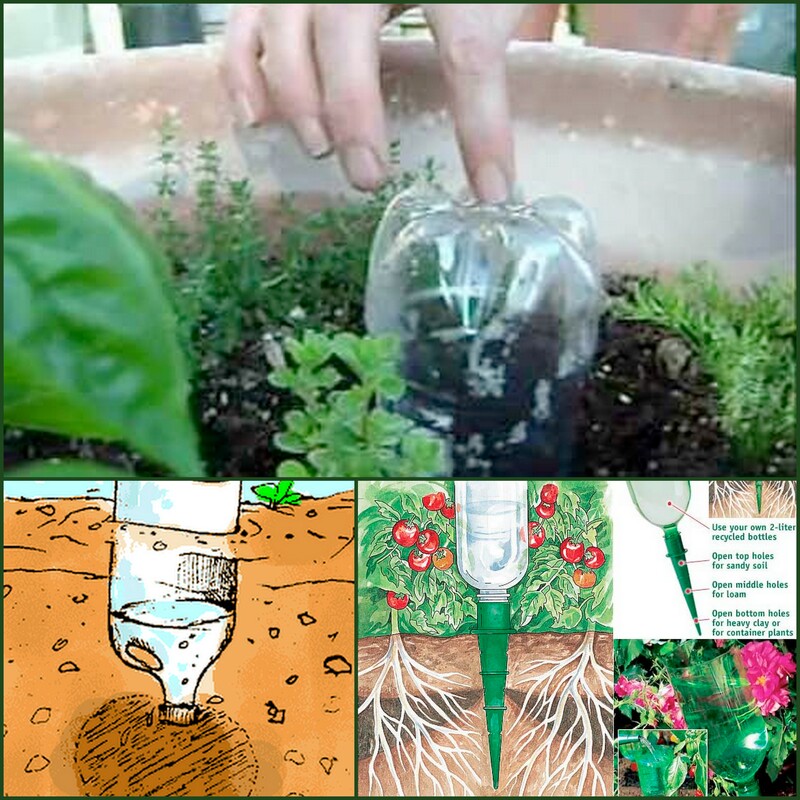 To allow for drainage, cut small holes in the bottom of the pots and line the bottom of each container with small rocks. Remember that potted plants need to be fertilized more often than outdoor plants. Make sure to keep your containers in an area that gets at least 4-5 hours of sunlight a day. If you have a balcony or extra space to dedicate to your plants, you can grow vegetables that require larger containers, such as cauliflower and brussel sprouts. If your space is more limited, eggplant, peppers (both bell and hot), salad greens and herbs all grow well in smaller containers. Carrots will also grow in small containers that are sufficiently deep. 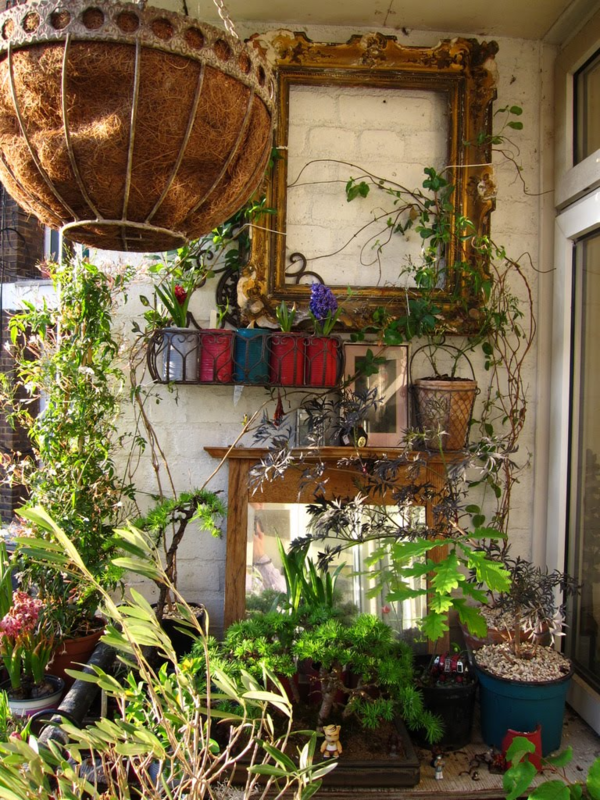 If you are lucky enough to have a balcony, you can use it to grow plants that require structural support. Tomatoes, cucumbers, beans and other vine plants require trellises, cages or poles to grow properly. You can use the beams and fixtures of your balcony as supports for these plants. If your space is really just too limited for plants but you still would like a garden, do some research into community gardens in your neighborhood. Some non-profits and community groups transform vacant lots into gardens where local people can rent plots. These lush urban oases provide a wonderful escape from city life and can give you an opportunity to meet other people in the neighborhood. So if it’s a garden you’re after, don’t let apartment life stop you. With a little creativity you can bring a little piece of the farm to the city. 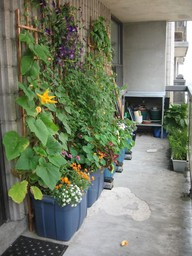 Tomatoes, cucumbers, potatoes and vine plants grow great on a balcony. Garlic, ginger and various herbs as well. Start small and soon you will be eating from your own patio garden! 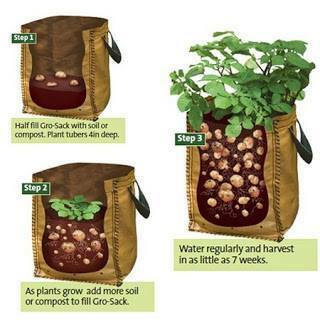 Re the potato box.im using same principle with salvaged car tyres.fill bottom one with soil,add seed pots and water. When shoots appear add another tyre and fill with soil.mine will be 5 tyres high when ready to harvest. Have you tried planting the potatoes with the box method yourself? How many seed potatoes can be planted in one box? Reblogged this on Healing the world. Reblogged this on Spirit In Action. I have grown tomatoes in a balcony with good success. One might also look into aquaponic gardening. What a great informative post! This is my first year growing potatoes in a garbage can and the plant is flowering. I am excited to harvest! I wish I had read your post first. An smaller container would have been a better size for my tiny backyard. I hope you don’t mind, but I put a link from my page, 7 Ways To Slash, Shave and Cut Your Monthly Expenses, to this page.